We have a very special Pokémon of the Week segment because we did two Podcasts in a two day period. So naturally, we picked related Pokémon add some relation to the episodes and water gun the week to a splashy start. It evolves from Poliwhirl when exposed to a Water Stone. It evolves from Poliwhirl when traded holding a King's Rock. This is not going to be our last VS, but it's an awesome way to have you guys participate to say which one you like better! Let us know in the comments! 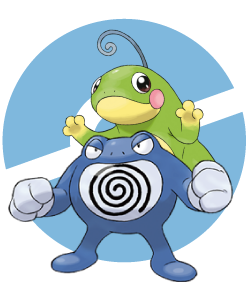 Do you evolve your Poliwhirl into Poliwrath or Politoed!? In addition to the Water-type abilities it had as Poliwag and Poliwhirl, Poliwrath has now gained the powers of a Fighting-type. It can swim for vast distances without tiring, swimming far and fast with minimal breathing, and is adept at such swimming styles as the front crawl and butterfly. With its increased arm and leg strength it also has the ability to run on the surface of water for a short amount of time. Like Machop, Poliwrath's muscles never grow fatigued, however much it exercises. Politoed have the standard Water-type abilities, but also gain impressive vocal abilities which can be used in battle in the forms Perish Song and Hyper Voice. They have also gained hopping abilities. Source: Bulbapeida and Here too.